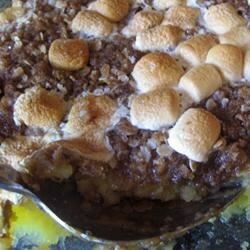 "Sweet potato side dish - so good it is almost dessert. Even if you don't like sweet potatoes, you will like this. Originally submitted to ThanksgivingRecipe.com." Combine the mashed sweet potatoes with the white sugar, soft butter or margarine, beaten eggs, vanilla and milk. Spoon into a 2 quart oven proof baking dish. Combine the coconut, flour, brown sugar, chopped nuts and melted butter. Sprinkle over the top of the sweet potatoes. Bake at 350 degrees F (175 degrees C) for 30 to 35 minutes. This is a satisfying Southern dessert that's perfect in fall and winter. I followed this recipe and it was EXTREMELY sweet! And topping was way too much. My kid ate it all right but my personal opinion it is just too sweet. So good! My niece who won't eat anything orange loved it. She is 25! It is just as good leftover. Very easy - 1 lg can of sweet potatoes comes out to 3 cups mashed. We were served this recipe at Thanksgiving 2002... It was a welcome change from the traditional "yams & marshmallows" dish. Very rich and filling...highly recommended! I'm the cook at our house. This was quite delicious, my wife teaches & took some to school to share with other teachers, now they want the recipe.